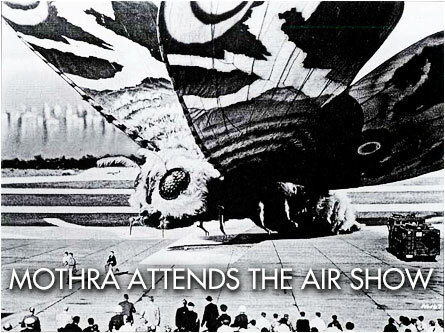 Saturday, July 30th, 2011 marks the 50th anniversary of Mothra, the world’s biggest kite. And to commemorate the occasion, Humax Cinema theatre in Japan (across the street from Starbucks™) is hosting a triple feature of Mothra films. While that’s cool, I’m thinkin’ a least festive balloons, some color coordinated paper plates and Dixie Cups™, pizza and a Rodan-flavored cake the size of Osaka would be a more appropriate way to honor the Queen of Monsters. 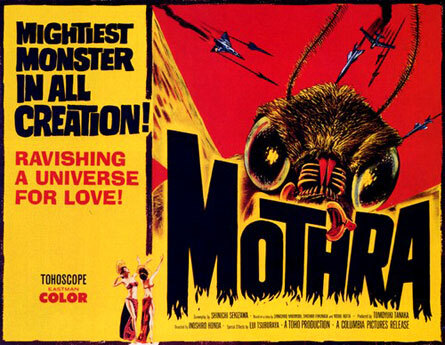 Having starred and appeared in no less than 17 movies, we’ve seen Mothra go from an eco-friendly, air traffic control problem, to a Defender of the Faith with floor models ranging from Fairy Mothra (two-seater) and Mothra Leo (a blue collar version), to Rainbow Mothra (alternative lifestyle) and Aqua Mothra (originally called Scuba Mothra…by me). And let us not forget, there’s also Armor Mothra, Eternal Mothra and Light Speed Mothra, who has more speeding violation citations than all the other Mothras combined. Through the last five decades, Mothra can be seen in various stages of the lepidopteran life cycle. (Of course I knew that.) Introduced first inside a blue egg so big it could make 3,012,445 omelettes, it hatched and out popped as caterpiller-esque larvae that, quite frankly, looked like one of Godzilla’s high-fiber bowel movements. Cocooning itself, Mothra sprayed herself a Silly String™ sleeping bag, cooked at 350 degrees for 40 minutes, then popped out as the 200-foot prom queen we know and fear for our lives today. 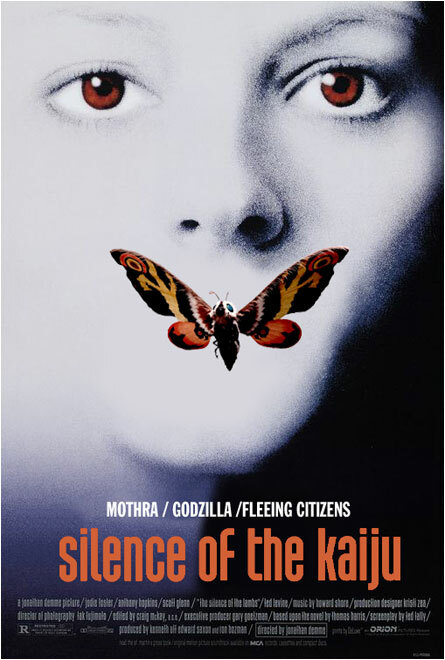 So what does Mothra actually do for a living? 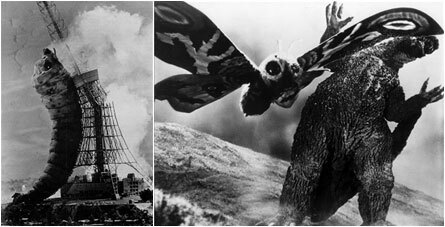 In addition to saving the Earth from itself, Mothra, like a monolithic Lassie, keeps rescuing 12-inch tall wayward citizens from her hometown of Infant Island and slapping Godzilla upside the radioactive plates on an ongoing basis. Good work if you can get it. So popular is Mothra the world over (chicks dig Mothra because of her fashion sense and sparkly beams that come out of her 80-foot Coach™ bag), the world’s fuzziest hang-glider has influenced everything from pop culture to spawning a 50-year cottage industry of video games, toys, action figures, action clothing, books, magazines and omelettes. With that, I only have one question: who keeps laying the eggs Mothra comes out of? Happy Birthday, Mothra – I would have bought you a present, but you wrecked all of the stores I normally shop in while in Japan. 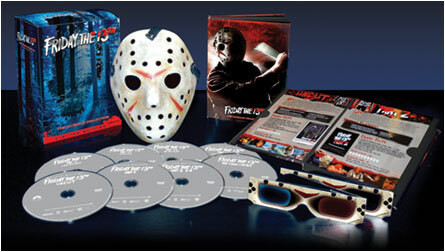 If you’re a fan of all things hockey and machete, then Friday the 13th: The Ultimate Collection should be right up your wazoo. Not sure what genius came up with the title as this assemblage of Jason’s greatest splits is far from being ultimate. And while we’re on the subject, a box set of what boils down to the same movie being made over and over seems overkill. (No pun intended. )To save money on the sequels, they should’ve just had Jason working in a slaughterhouse, chopping up meat coming down a conveyor belt. But instead of delicious steaks, tummy-filly hamburgers, sizzling raw bacon and mystery meat hot dogs, he’d be hacking teenagers. To be fair – AND I AM – the box set does come with eight billion extras (too many to list because I’m freakin’ LAZY), a book (if I wanted to read, I’d go to the library) and a hockey mask. Sure, you could go out and buy an hockey mask at any sporting goods store, but any serial killer could do that. Again, if you’re a fan of the longest running one-punch line joke in movie history, then Friday the 13th: The Ultimate Collection belongs in your wazoo. It comes out in October if you give a dang/darn/hoot/crap. Horror movies have been ripping off each other since cavemen filmmakers first picked up a video camera and filmed hockey-masked dinosaurs stalking supermodel cave counselors. Countless are the examples of title, cover art, monster and plot pilfering that permeates the horror/sci-fi realm to the point where no one even tries to hide it anymore. Need a specific precedent? Coke™ / Pepsi™. A debauched Hollywood movie actor tries to piece together one wild night in Miami which remains a drug-induced blur. He almost figured it out until a tremor released some subterranean creatures into his stylish mansion and they ate him. An alcoholic who is prone to frequent blackouts (brought about by excessive drinking, duh) gets a wake-up call when his wife decides to leave him and their only child. Before he can rehab it, subterranean creatures, in town for the Earthquake Festival, eat his wife and only child in front of him. Screw sobriety. 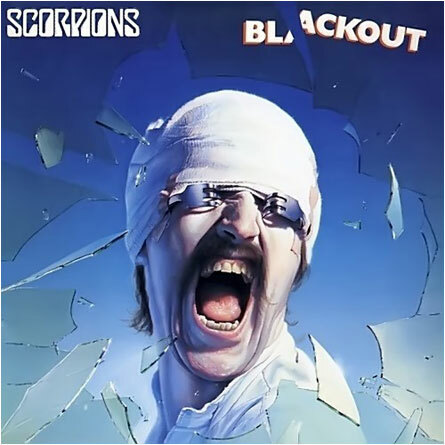 Four rowdy psychopaths take over and vandalize a ritzy Manhattan apartment building during the New York power blackout, assaulting people’s personal spaces. 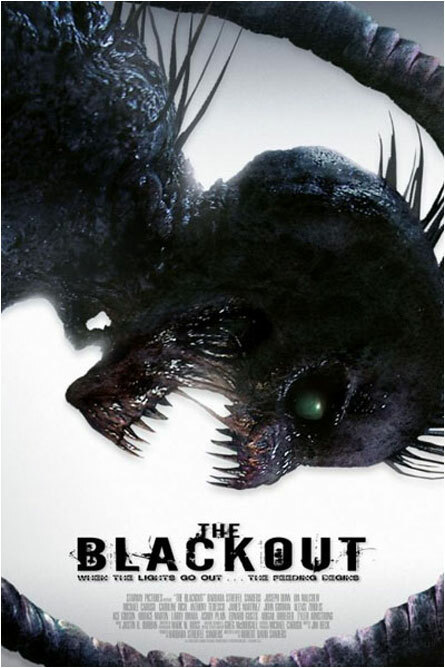 Pissed off that this movie lifted that part from Death Wish (1974), the subterranean creature’s all time favorite movie, the monsters wait until an fissure opens their door and they go and have a four-course psycho meal. The explosive story of a forgotten New York neighborhood during the largest power failure in American history. Of course they were forgotten – after unscrewing all the light bulbs in New York, subterranean creatures ate the entire neighborhood. By candlelight. Three people wind up trapped in an elevator with subterranean creatures. The fun begins when the trapped citizens don’t realize the other passengers are flesh eaters. Going down. 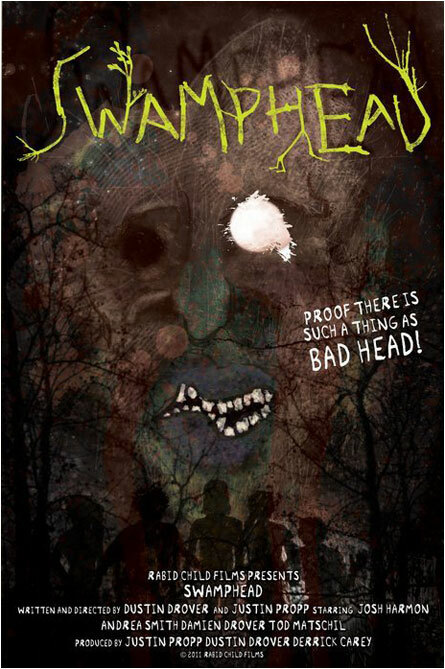 Swamphead is not only a cool name to have on your birth certificate and/or driver’s license, it’s the title of an almost-done independent horror movie about a severed noggin pulled up out of a swampy lake where it had been holding its breath for some time. Once on the surface and its hair towel dried and styled with some product, the head goes on a killing rampage. I bet if you look up “awesome” in the dictionary, it’ll have Swampy’s picture. 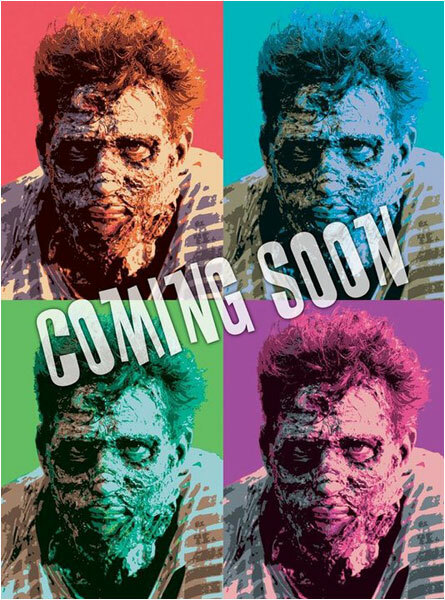 The movie promises a “nightmare of a nightmare of blood, feces, and more head than a night in Tijuana.” One of those things I can do without. But hey, all you German horror fans – it’s all yours. So how does a severed head kill teens? Biting would be my first guess. I suppose it could throw itself at your stomach like a dodgeball, but with teeth instead of a valve. Or it could spit on you and since its germs are zombified, if you get any spit in your eye you’ll turn into a dead someone. I’m hoping that the filmmakers have Swamphead’s head being stuffed into a large pipe that turns out to be an ancient cannon that somehow goes off and blasts into the teenagers, killing their faces off. Then they could have Swamphead rolling happily away, singing a nice song or whistling. I’m pretty sure severed heads can still whistle. Or maybe he rolls across a whistle laying on the forest floor and starts honkin’ on that thing. I know I would. 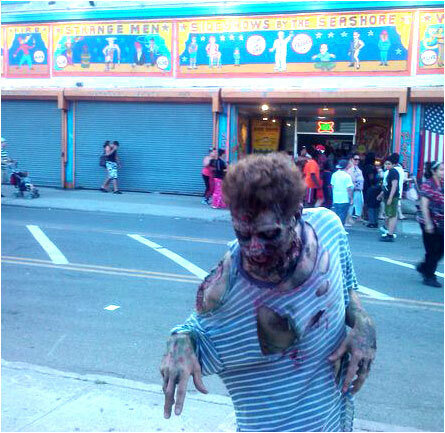 This could be an epic showdown as zombies are a little sensitive to criticism. That, and once you piss them off, next thing you know your skin is suitable for framing. Zombie Bohemia sounds cool. And this sandwich I’m eating freakin’ rocks. 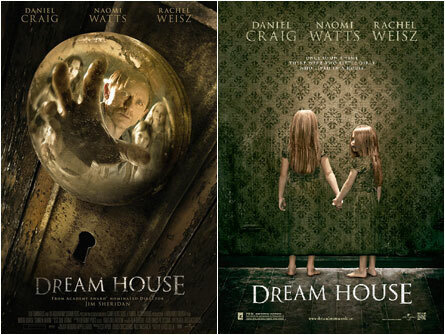 Dream House is a stylish haunted house movie coming out at the end of September, 2011. Hardly a dream house – there were grisly murders committed in there long before this guy moves there with his wife and two young daughters. If a bear committed the crimes, then I’d describe it as “grizzly murders.” But there aren’t any bears in this horror movie. Pity, as bears are kinda scary and would make for cool murderers. Oh, well. The trailer, which makes Dream House look like a cross between The Shining (1980) and The Amityville Horror (1979), looks like it gives away the movie’s twist ending. And because it implies ghostly visitations/hallucinations, feel free to imagineer a bear in there. I did. 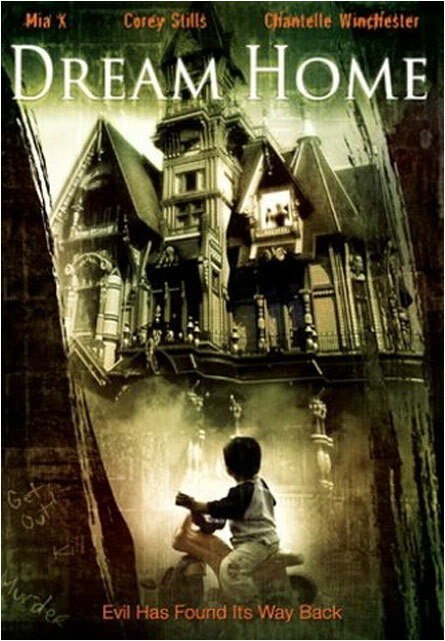 I’m sure Dream House is going to be better than Dream Home (2006), another similarly titled haunted house ghost-y flick that sucked donkey ectoplasm. A young married couple (good – best not to live in sin) move into a new home are plagued by ghosts. 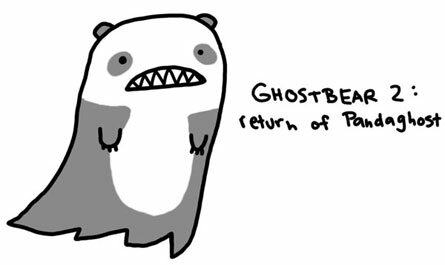 Since their “dream home” is located in rural Louisiana, it’s probable the hauntings could be the work of…GHOST BEARS. I have no idea what the hell is wrong with me today. When one thinks of a horror movie antagonist, a fuzzy rabbit hardly ever shows up on the radar. 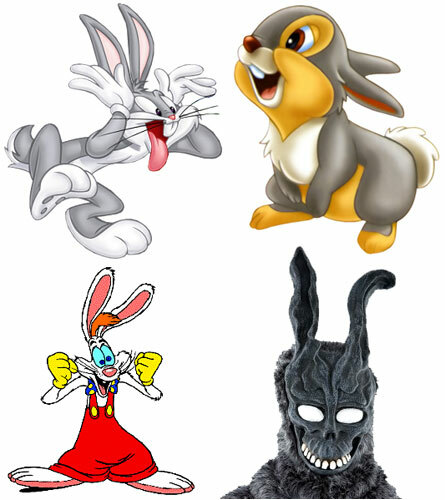 Oh sure, there have been horror rabbits before, from homicidal maniac Bugs Bunny to Thumper, the lovable cannibal rabbit, who ate Bambi alive in front of her forest friends. And let us not forget Roger Rabbit, who was so hopped up (sorry) on drugs, he appeared cartoonish. Then there was Frank, the hallucinogenic dream state rabbit in Donnie Darko (2001) who made you creep your pants. 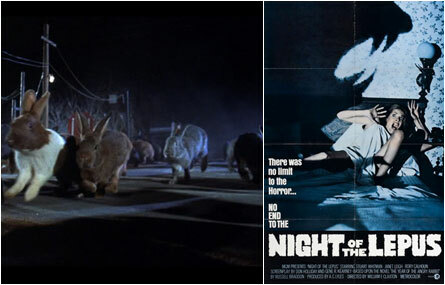 And perhaps the most famous horror movie rabbits of all time were the car-sized mutants in the 1972 sci-fi movie, Night of the Lepus. 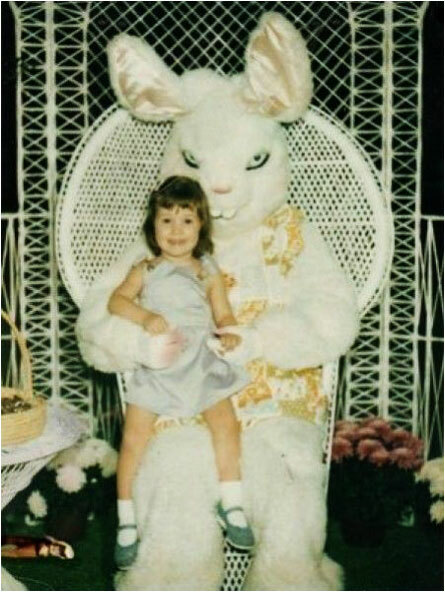 But by and large (sorry) rabbits in horror movies have been sporadic. Until now. 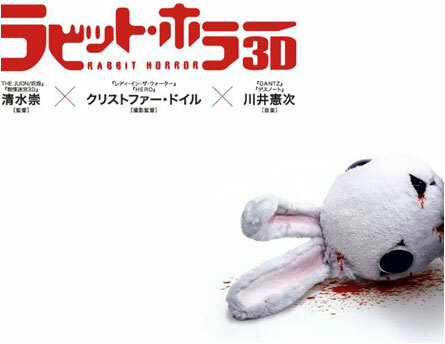 As dumb as this all sounds, I feel compelled to want to see Rabbit Horror 3D. I don’t know why. Maybe it’s because these fuzzy footballs bring back cherished childhood memories (see photo below). Good times.